Harri Stickler was diagnosed with Acute Lymphoblastic Leukaemia, a rare type of blood cancer, on December 5th, 2018. His mum, Bethan, took her son to the GP after she noticed swelling under his eye and her instinct told her something wasn’t right. After seeing Harri, his GP called an ambulance which took him straight to Prince Charles Hospital in Merthyr Tydfil, where they initially tested him for meningitis. He was later diagnosed with leukaemia and transferred to University Hospital Wales in Cardiff, where he has been receiving treatment ever since. Speaking about his diagnosis, Harri’s grandmother Anne, said: ‘I saw Harri a couple of days before he was diagnosed and he didn’t seem ill at all, so the news came as such a shock, it’s just awful. ‘He was in hospital over Christmas so as a family we didn’t celebrate at all, it was just like any other day at the hospital. But even though he’s really ill, he’s still happy, he’s still our boy. 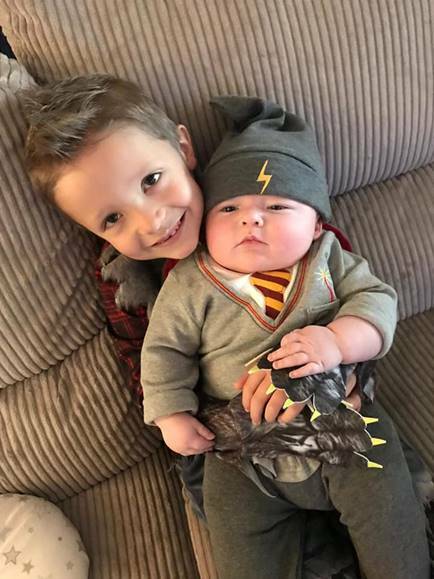 Harri is currently having weekly chemotherapy treatment but his family have been told that he will need a stem cell transplant from a matching donor, if he is to be cured of his cancer. Around 75% of UK patients won’t find a matching donor in their families and blood cancer charity Anthony Nolan is now searching the stem cell register for a special stranger who could save Harri’s life. His family are taking this opportunity to campaign for more people to come forward and join the Anthony Nolan register, to help other babies, children and adults in the same situation as Harri. Karen Archer, Anthony Nolan Regional Development Manager for Wales, said: ‘We are doing everything we can to support Harri’s family in their search for a lifesaving stem cell donor. Every day, five people, like little Harri, will start their search for a matching stranger to give them a second chance of life.